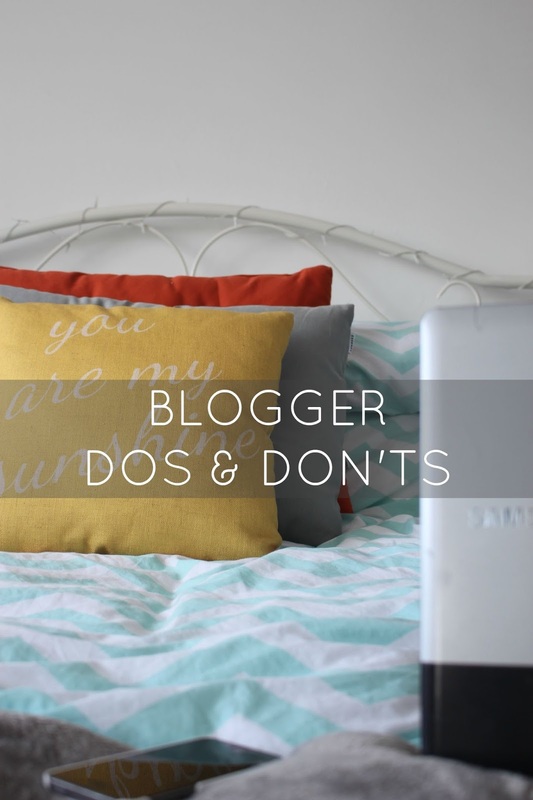 There are a million things bloggers get told what to do and what not to do, but I thought I'd talk about some of the blogging dos and don'ts I think are important whether you're new or old to blogging. We all know that there are bloggers and photographers out there that can take perfect pictures you can never live up to, but it's important to use your own pictures to personalise your blog and your posts. I hate seeing blog posts which use pictures off Pinterest or a search engine when they could get out their phone and take some of their own. If you are using other people's photo make sure you source it and use copyright free photos, using photos you've found on Google images can get you into a lot of trouble. Disclaimers are on blogs for a reason, whether it's at the end of a blog post, in the YouTube about video section or on a linked page. By law you have to state if you're being paid to write content or feature a product. It's also common courtesy to be truthful to your readers and followers if what you're writing is sponsored or you've been giving something for free. Social media accounts are a fantastic tool for blogging, they allow you to promote your content and are great for you to interact with your readers. It's also common for readers to follow your social media accounts instead of by Bloglovin or subscribing by email, I know that's what I do. If you do have social media accounts make sure they're easy to find on your blog because no one wants to hunt your page just to tweet you. I can be one to talk here because I don't always post every other day like I aim to, but if you do want more people to read your blog and your current readers to stay where they are you need to make sure your content is being posted on a regular basis, even if it's just once a month. It goes the same for social media accounts, if you post on a regular basis then you'll gain more followers and the followers you do have will stay put. This goes for spamming other bloggers with your links or questions or spamming your links on social media in general. It's great that you want to promote your site but you need to make sure the link sharing is spread out throughout the day and actually talk to people without inserting your link each time to show you're a normal person, Social media sites can even block you if you post links too much in a set time! If you take part in Twitter blogger chats that's fantastic, I love them and think they're a great way to learn things and interact with other like minded people. You know what 80% of those people in the chats hate? People who use the hashtag at the time of the chat just to promote themselves because the chats are there to interact and help each other and you'll only get negative feedback from doing it. It's easy to not know when these chats here but you can find out, I even have a post here with a bunch of the chat times listed. This pretty much speaks for itself. If you blog for the benefits then you shouldn't be doing it full stop, You should be blogging because you actually want to blog and trust me, you won't get the money, followers, products or money if you don't actually put passion into it. I hope this has given you a little guidance, if someone told me these things when I first started blogging it would have really helped!